Alboreto in 1988, driving for Scuderia Ferrari. Michele Alboreto (23 December 1956 – 25 April 2001) was an Italian racing driver. He was runner up to Alain Prost in the 1985 Formula One World Championship, as well as winning the 1997 24 Hours of Le Mans and 2001 12 Hours of Sebring sports car races. Alboreto competed in Formula One from 1981 until 1994, racing for a number of teams, including five seasons (1984–88) for Ferrari. The Italian's career in motorsport began in 1976, racing a car he and a number of his friends had built in the Formula Monza series. The car, however, achieved very little success and two years later Alboreto moved up to Formula Three. Wins in the Italian Formula Three championship and a European Formula Three Championship crown in 1980 paved the way for the Italian's entrance into Formula One with the Tyrrell team. Two wins, the first in the final round of the 1982 season in Las Vegas, and the second a year later in Detroit, earned him a place with the Ferrari team. Alboreto took three wins for the Italian team and challenged Alain Prost for the 1985 Championship, eventually losing out by 20 points. The following three seasons were less successful, however, and at the end of the 1988 campaign, the Italian left Ferrari and re-signed with his former employers Tyrrell, where he stayed until joining Larrousse midway through 1989. Further seasons with Footwork, Scuderia Italia and Minardi followed during the tail end of his F1 career. In 1995, Alboreto moved on to sportscars and a year later the American IndyCar series. He took his final major victories, the 1997 Le Mans 24 Hours and 2001 Sebring 12 Hours, with German manufacturers Porsche and Audi respectively. In 2001, a month after his Sebring victory, he was killed testing an Audi R8 at the Lausitzring in Germany. Michele Alboreto started his career in 1976 racing in Formula Monza with a car he and his friends built, known as the "CMR". The car itself proved to be uncompetitive and in 1978 Alboreto, now in a more competitive March, moved over to Formula Italia where he began to take race wins. Two years later Alboreto moved up to Formula Three, racing in a Euroracing-entered March-Toyota in both the European and Italian series. In his début Formula Three season, Alboreto finished 6th and 2nd respectively in the two championships, scoring three wins in the Italian series. 1980 would prove to be the Italian's final, and most successful, year in Formula Three where he took the European crown and finished third in the Italian championship, taking five wins between the two series. An appearance in the British Championship was also made that year. Alboreto's European title earned him a move into Formula Two, a feeder series for Formula One, with the Minardi team. He scored Minardi's only F2 victory, at Misano, during the 1981 season where he finished eighth in the championship. Despite his career in open wheel racing, Alboreto was chosen by Lancia to be part of their official squad in the World Championship for Makes, running in rounds which did not conflict with his other races. He shared the Group 5 category Lancia Beta Montecarlo with Walter Röhrl or Eddie Cheever on four occasions during the 1980 season, scoring three second-place finishes and a fourth. 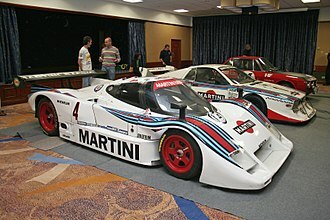 A Lancia LC1 which Alboreto drove to three victories during the 1982 World Endurance Championship. Alboreto again ran a partial schedule in 1981 even though he was also running Formula Two and Formula One. This season included his first participation in the 24 Hours of Le Mans. He earned an eighth-place finish overall, second in class, and was the highest finishing Lancia. He followed this with his first win in the championship, at the Six Hours of Watkins Glen with co-driver Riccardo Patrese. Alboreto finished the year 52nd in the Drivers' Championship, the highest ranked Lancia driver. When Lancia chose to move to a new class of competition with the Lancia LC1 as the championship concentrated solely on endurance races in 1982, further success came for Alboreto. A small schedule for the championship, as well as an emphasis on European circuits allowed him to compete in every race that year. Although the LC1 suffered from mechanical problems on its debut, Alboreto and teammate Patrese were able to rebound to earn a victory at the 1000 km of Silverstone. Teo Fabi joined the duo for the 1000 km of the Nürburgring, where they once again earned a victory. He was not able to repeat his previous success at Le Mans when the LC1's engine failed, and was unable to complete an event at Spa when the car broke in the closing laps. A third victory was earned by Alboreto and new teammate Piercarlo Ghinzani at their home circuit, Mugello. The final two races of the World Championship season had Alboreto's car eliminated from contention due to accidents. At the end of the season, he had secured fifth in the Drivers' Championship. Lancia changed classes and cars once again in 1983 World Sportscar Championship season, but Alboreto remained as one of the team's primary drivers. He brought the new Lancia LC2 to a ninth-place finish in its debut at the 1000 km of Monza, but the new car struggled to finish the next few races of the season. His entries would not finish another race until round five, where he earned eleventh. 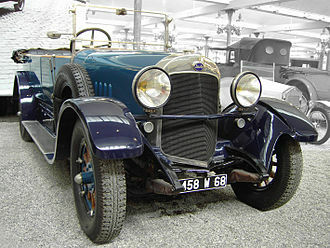 While Lancia chose to skip later rounds of the championship, he would not return to the team in order to concentrate fully on his commitments to Formula One. His troubles with the LC2 and early departure from the team earned him only two points in the championship. The Tyrrell 011 used by Alboreto during the 1982 and 1983 seasons, a car which helped the Italian win the 1982 Las Vegas Grand Prix and the 1983 Detroit Grand Prix. At the age of 24, Alboreto made his Formula One debut at the 1981 San Marino Grand Prix for the Cosworth-powered Tyrrell Racing team, replacing Ricardo Zunino after the Argentine failed to impress team boss Ken Tyrrell. Unfortunately for the Italian, a collision with fellow countryman Beppe Gabbiani put him out of the race after completing 31 of the 60 laps. Alboreto failed to score a single point during his debut year, his highest position being ninth at the Dutch Grand Prix. In comparison to the previous season, Alboreto had a more successful 1982 campaign. The Italian took the first podium of his Grand Prix career at Imola and, at the final round in Las Vegas, Alboreto took his first Grand Prix win. He is the last winner of the Caesars Palace Grand Prix as the following year, the track was axed from the calendar. Alboreto scored a total of 25 points during his second season of F1, finishing as the top Italian in eighth place overall. Despite a win in Detroit, registered as the last victory for a naturally aspirated car until the end of the turbo-era in 1989, after Nelson Piquet's leading Brabham suffered a rear tyre deflation in the closing stages, Alboreto failed to finish in the points consistently and, with only one further points finish at Zandvoort, the Italian finished the season with ten points and down in twelfth position. However, it was announced that the Italian would partner René Arnoux at Ferrari. Replacing Patrick Tambay, he became the first Italian driver to race for the marque in over a decade. Alboreto at the 1984 Dallas Grand Prix. The Ferrari driver retired from the race after spinning off the track with 13 laps remaining. 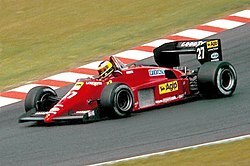 In his debut season for Ferrari, Alboreto took victory in the third round at Zolder becoming the first Italian driver to win an F1 Grand Prix for Ferrari since Ludovico Scarfiotti won the 1966 Italian Grand Prix. He would finish on the podium a further three times: at the Österreichring where he finished third; Ferrari's home circuit of Monza where he finished second; and at the Nürburgring, where he also finished in second place despite running out of fuel going into the final turn (the close following Brabham-BMW of reigning World Champion Nelson Piquet also ran out of fuel at the final turn allowing Alboreto to keep his 2nd place). Alboreto finished the 1984 season in fourth with 30.5 points, the half point coming from his sixth place at the Monaco Grand Prix which was cut to under half its original race distance due to heavy rain, resulting in half points being awarded. Alboreto at the 1985 German Grand Prix. 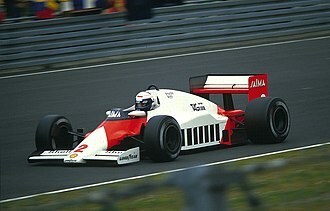 The Italian took the race win, eleven seconds ahead of the World Champion-to-be Alain Prost. "In the end he had to settle for runner-up, because the Ferrari wasn't as good a car as the McLaren – and also, truth be told, because neither was Michele as good as Alain. No disgrace in that." 1985 would prove to be Alboreto's most successful year in Formula One. He took two wins: the first at the Canadian Grand Prix, and the second at the German Grand Prix. Alboreto finished the season in second place with 53 points, 20 points behind World Champion Alain Prost. Formula One journalist Nigel Roebuck commented that "Alboreto was Prost's only real challenger for the World Championship". Ultimately it was Ferrari's unreliability which cost Alboreto his chance at the World Championship as he failed to finish the final five races of the season all due to mechanical failure, though he was classified 13th in Italy despite blowing his engine on lap 45 of 51. Michele Alboreto saw his World Championship dream go up in flames on lap 13 of the 1985 European Grand Prix at Brands Hatch. After stopping to replace a flat-spotted tyre on lap 11, his Ferrari blew its turbo halfway through lap 13. Alboreto, frustrated that Ferrari's late season reliability had cost him the World Championship (he led the points table until Round 11 at Zandvoort) drove the car back to the pits with the rear of the car on fire. He (dangerously) drove the on-fire car into the pits and straight to his Ferrari pit. Many observers saw this as Alboreto's way of showing that the Ferrari's unreliability had cost him the World Championship, which Prost won by finishing 4th in the race. In 1986 Ferrari's new car, the F1/86 designed by Harvey Postlethwaite, proved to be slower and less reliable than its predecessor as Alboreto retired from a total of nine races: only two of those retirements are counted as driver error while the remaining seven were mechanical failures. 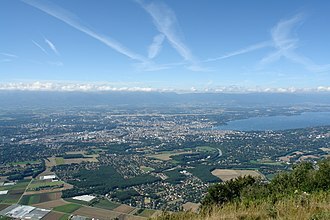 Alboreto only scored one podium, at the Austrian Grand Prix – even then both Williams cars of Nigel Mansell and Nelson Piquet had retired and Alboreto finished a full lap behind race winner Alain Prost. The Italian finished the season ninth in the Drivers' Championship with fourteen points. While the Ferrari V6 turbo was rated as one of the more powerful engines on the grid, both Alboreto and teammate Stefan Johansson were hampered by the F1/86 which refused to handle on tracks which had a bumpy surface. Johansson finished 5th in the championship with 23 points despite being the #2 driver in the team, causing many to question why the team chose to re-sign Alboreto and let Johansson go. Alboreto driving for Ferrari in his last season with the team, at the 1988 Canadian Grand Prix. Austrian Gerhard Berger joined Ferrari in 1987 which signalled the end of Alboreto's time as leader of the Ferrari team. Berger soon established himself as the team's number one driver thanks to his wins in Japan and Australia at the end of the season, while Alboreto could only manage a handful of podiums at Imola, Monaco and a second place at the final round in Australia to make it a Ferrari one-two. The Italian finished the year in seventh overall with 17 points, 13 points behind his teammate. The 1988 season would be Alboreto's final year with Ferrari. With the McLarens of Ayrton Senna and Alain Prost dominating the season, the Ferrari team only managed a single win during the year at the Italian Grand Prix which Berger won from Alboreto in second place. After a disappointing '88 season with Ferrari, the team refused to offer the Italian a new contract and so Alboreto looked elsewhere for a drive. This announcement came at the French Grand Prix in July and pit lane rumours had Michele re-joining Tyrrell for 1989 (in France, where Alboreto finished 3rd and Berger a distant 4th, was the only time in 1988 the Italian would finish in front of the Austrian in a race where both finished). After France he received an offer from Frank Williams, head of the Williams team who would have exclusive use of the new V10 Renault engine in 1989. Later that year before the Italian GP at Monza, Alboreto had not received any word from Williams and requested confirmation of his seat at the team. 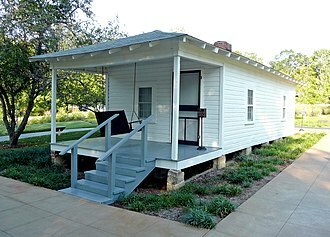 Williams replied by saying that "he wanted him" and "not to move". The Brit, however, went back on his word and at Monza announced he had signed Belgian Thierry Boutsen instead while also confirming that the teams number 2 driver, Alboreto's former Lancia sportscar teammate Riccardo Patrese, would be staying with the team. As it was late in the season, Alboreto was left with very little options for the coming season. Alboreto competed in eighty Grands Prix for Ferrari, which established a new record. It stood until the 1995 Argentine Grand Prix, when it was surpassed by Berger. A lack of a drive had left Alboreto in a difficult situation and he later admitted he contemplated retirement – an option of which his family were very much in favour. 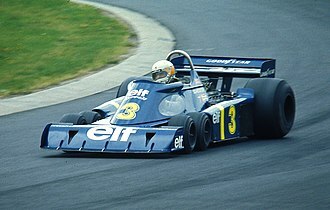 Soon enough, however, he was offered a drive at his former employer Tyrrell, which he accepted. The relationship between Alboreto and team boss, Ken Tyrrell, soon turned sour. At the Monaco Grand Prix, Alboreto was told to drive the 1988 model Tyrrell 017, due to the newer 018 model not being completed. Teammate Jonathan Palmer was chosen to drive the new monoshock 018. Meanwhile, the Italian would have to wait until the following day for the 018 and so he decided not to accept this. The result was Alboreto boycotting the Thursday practice session. This lack of professional behaviour did not impress the team. Alboreto finished the race in fifth position during while Palmer finished ninth. This was followed by a strong performance at the next race in Mexico, where Alboreto finished 3rd – the only podium the team would achieved during the season. By the French Grand Prix, Ken Tyrrell had found a new sponsor in Camel cigarettes for the race and told Alboreto to end his personal sponsorship deal with Marlboro, a rival brand to Camel. Alboreto was disappointed, as thanks to his Marlboro backing, the team had managed to fund his wages. Following Alboreto's refusal to cut his ties with his sponsor, Tyrrell replaced him with the up-and-coming Jean Alesi. Alesi enjoyed a successful first Grand Prix in which he finished fourth. Alboreto soon lost his Marlboro sponsorship as well after they refused to find him another drive for the rest of the 1989 season. He was, however, soon hired by the French Larrousse team, incidentally co-sponsored by Camel, for the German Grand Prix and the rest of the season. Despite his new teammate Philippe Alliot showing that the Lola LC89 with its 625 bhp (466 kW; 634 PS) Lamborghini V12 engine could be a competitive car with high grid positions and challenging for points in various races, Alboreto couldn't come to grips with the LC89 and failed to score a single point for the rest of the season, and twice he actually failed to pre-qualify (though it must be said that pre-qualifying in 1989 was generally dominated by those using Pirelli's superior qualifying tyres, whereas Larrousse used Goodyear rubber). During qualifying for the Hungarian Grand Prix the Italian cut one of the chicanes and broke two of his ribs in the process. After competing the year for two teams, Alboreto finished the year eleventh in the Drivers' Championship with six points. 1990 saw Alboreto move to the Arrows team, which was in the process of being sold to sponsor Footwork. It was seen mainly as a "transition year" for him, as the chassis was in its second year and severe uncompetitiveness would be expected. Despite this, the 33-year-old finished in the top ten a number of times and only retired three times. Alboreto finished the season, however, as one of 21 drivers who failed to score a point. Footwork secured Porsche works engines for 1991 and sponsorship from Japan, as the Footwork company completed its takeover of the team. The package did not, however, live up to its expectations as it failed to qualify a number of times. Soon the overweight and unreliable Porsche engines were replaced by Hart-supplied Cosworth engines for the rest of the season, the short-term fix not improving the team's competitiveness. This would be Alboreto's second season in succession that he failed to score a point. Thanks to Footwork's Japanese connections the team received a supply of Mugen Honda V10 engines for 1992. The FA13 was reliable in comparison to its predecessor and Alboreto scored points four times, in addition to finishing in seventh place six times. With a season total of six points, the 35-year-old finished the year tenth overall. Alboreto joined Italian team Scuderia Italia, which had enjoyed a number of successes in its short history, most notably when Andrea de Cesaris and JJ Lehto had scored podium positions at the 1989 Canadian Grand Prix and 1991 San Marino Grand Prix respectively. At the start of 1993, however, the team moved away from its Dallara-built chassis and onto Lolas, a move considered "disastrous" by many Grand Prix journalists. The Italian failed to score any points over the year, and failed to qualify several times as the slowest runner in the 26-car field. Scuderia Italia withdrew before the end of the season, and merged with fellow Italian team Minardi for 1994. 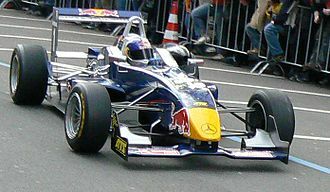 The Minardi cars proved to be mostly uncompetitive and unreliable, with a total of nine retirements from sixteen rounds. Only a sixth position in Monaco was any consolation for Alboreto. At the end of the season, he decided to retire from Grand Prix racing, with a record of 194 starts and five Grand Prix wins to his name. At the 1994 San Marino Grand Prix (which itself was overshadowed by the deaths of Ayrton Senna and Roland Ratzenberger), whilst leaving the pitlane after a scheduled stop, Alboreto's car lost his loose right rear wheel which bounced through the Benetton, Ferrari, and Lotus pit areas and crews, injuring several mechanics. Following his departure from Formula One in 1995, Alboreto embarked on a career in the German Touring Car Championship, known as the Deutsche Tourenwagen Meisterschaft. Racing for Alfa Romeo's factory team, Alfa Corse, the Italian finished 22nd in the championship, scoring four points. Further entries in the International Touring Car Championship and World Sportscar Championship, the latter being with Ferrari, also proved to be fruitless ventures. Alboreto returned to open-wheel racing in 1996, entering the newly formed Indy Racing League (IRL) with Scandia/Simon Racing. The then 39-year-old competed in all three rounds where he finished fourth on his debut at Walt Disney World Speedway; eighth at the Phoenix International Raceway; and retired, due to gearbox problems, at the 1996 Indianapolis 500, his sole entry into the famous oval race. Alboreto also ran sports prototypes for Scandia/Simon while in the United States, entering the IMSA World Sports Car Championship with a Ferrari 333 SP. He also entered the Le Mans 24 Hours in a Joest Racing-entered Porsche WSC-95 alongside fellow Italian and former F1 teammate Pierluigi Martini and Belgian Didier Theys, but retired due to an engine failure after completing 300 laps. The following year, Alboreto earned his first, and only, podium in the IRL at the "True Value 200" held in New Hampshire, where he finished third. A further fifth place at Las Vegas earned Alboreto 62 points during his 1997 campaign which resulted in a 32nd place overall in the drivers' championship. 1997 for the Italian, however, would be remembered for winning the Le Mans 24 Hours with the same car as the previous year, but this time alongside Swede Stefan Johansson, another former F1 teammate, and Dane Tom Kristensen, who would later go onto beat Jacky Ickx's record for winning the most Le Mans 24 Hour races. The trio completed 361 laps, one more than second placed Gulf Team Davidoff's BMW-powered McLaren F1 GTR. This would prove to be the peak of Alboreto's sportscar success as he failed to finish at Le Mans in 1999 with newcomer Audi. However, a third at the 2000 Le Mans 24 Hours, victory at the 2000 Petit Le Mans and a win at the 2001 Sebring 12 Hours gave the Italian some final success prior to his death a month after his win at Sebring. An Audi R8 as it appeared in 2000 when Alboreto was testing at the Lausitzring. In April 2001, Alboreto was performing straight-line speed tests in an Audi R8 at the Lausitzring, near Dresden, Germany. A tyre blow-out caused his car to veer off track and crash into a wall, killing him. At the time, Audi gave no reason for his death, citing that the R8 had "already completed thousands of test kilometres on numerous circuits without any problems". Alboreto's death brought much anguish among his family and friends. Michele's cousin Marisa told Italian news agency ANSA "You can't imagine what we're going through as a family. We're really distraught." Fellow Italian Giancarlo Fisichella dedicated his podium finish at the 2005 Italian Grand Prix to Alboreto, "I know Alboreto was the last Italian on the podium at Monza before me. I was lucky enough to race together with him in touring cars, and he was a great person, really special. I want to dedicate the result to his memory." Alboreto's helmet was blue with a yellow stripe with white edges covering the centre of the helmet. The colours were a tribute to Ronnie Peterson, whose helmet design also used them. 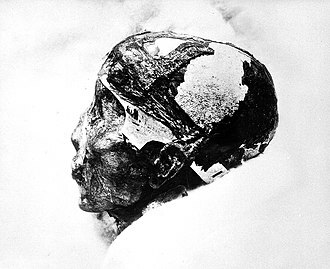 † Did not finish, but was classified as he had completed more than 90% of the race distance. ‡ Race was stopped with less than 75% of laps completed, half points awarded. Rainer Nyberg and Mattijs Diepraam. "Nearly Ascari's successor". 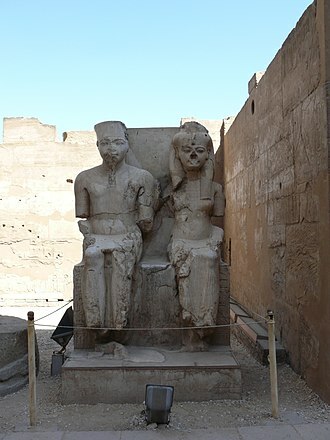 8W – Who?. Retrieved 18 March 2008. "GP Encyclopaedia – Michele Alboreto". GrandPrix.com. Retrieved 9 July 2008. Formula One – "Official Formula One Website's Results archive (1981–1994)". Official Formula One website. Archived from the original on January 21, 2008. Retrieved 19 March 2008. Formula Two – Stefan Örnerdal and Andrew Horrox. "Le Mans & F2 Register". Formula2.net. Archived from the original on 11 October 2007. Retrieved 19 March 2008. Sportscars – "World Sportscar Championship". Classiccars.com. Archived from the original on September 27, 2007. Retrieved 19 March 2008. ^ a b Roebuck, Nigel (12 December 2007). "Ask Nigel:Memories of Michele Alboreto". Autosport.com. Retrieved 18 March 2008. ^ "ALBORETO WINS CANADIAN GRAD PRIX". The New York Times. 17 June 1985. Retrieved 1 October 2012. ^ FIA Formula 1 World Championship – 1995 Season Review (VHS). Duke Video. 11 December 1995. Event occurs at 25:10–25:30. EAN-13 5 017559 034955. Retrieved 20 August 2008. ^ "Motor racing: Alboreto pilots Porsche through fiery finish". The Independent. 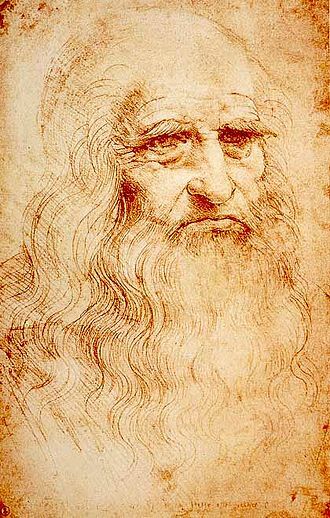 16 June 1997. Retrieved 1 October 2012. ^ a b Alboreto Is Killed Testing Audi R8, New York Times, April 26, 2001, Page D7. ^ a b "Alboreto dies in crash". BBC Sport. 26 April 2001. Retrieved 17 March 2008. ^ "Fisichella Dedicates Podium to Alboreto". Autosport Official Website. 5 September 2008. Retrieved 2 April 2008. ^ "Grand Prix Hall of Fame – Ronnie Peterson – Images". 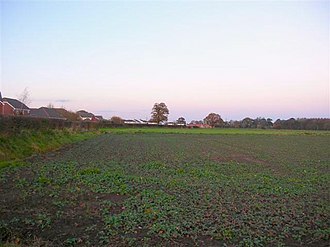 Retrieved 18 November 2011. Wikimedia Commons has media related to Michele Alboreto. Audi is a German automobile manufacturer that designs, produces and distributes luxury vehicles. Audi is a member of the Volkswagen Group and has its roots at Ingolstadt, audi-branded vehicles are produced in nine production facilities worldwide. The modern era of Audi essentially began in the 1960s when Auto Union was acquired by Volkswagen from Daimler-Benz. After relaunching the Audi brand with the 1965 introduction of the Audi F103 series, Volkswagen merged Auto Union with NSU Motorenwerke in 1969, the company name is based on the Latin translation of the surname of the founder, August Horch. Horch, meaning listen in German, becomes audi in Latin, the four rings of the Audi logo each represent one of four car companies that banded together to create Audis predecessor company, Auto Union. Audis slogan is Vorsprung durch Technik, meaning Advancement through Technology, since 2007 Audi USA has used the slogan Truth in Engineering. Audi, along with BMW and Mercedes are among the luxury automobile brands in the world. Originally in 1885, automobile company Wanderer was established, becoming a branch of Audi AG, another company, NSU, which later merged into Audi, was founded during this time, and supplied the chassis for Gottlieb Daimlers four-wheeler. On 14 November 1899, August Horch established the company A. Horch & Cie. in the Ehrenfeld district of Cologne, three years in 1902 he moved with his company to Reichenbach im Vogtland. On May, 10th,1904 he founded the August Horch & Cie. Motorwagenwerke AG, after troubles with Horch chief financial officer, August Horch left Motorwagenwerke and founded in Zwickau on 16 July 1909, his second company, the August Horch Automobilwerke GmbH. His former partners sued him for trademark infringement, the German Reichsgericht in Leipzig, eventually determined that the Horch brand belonged to his former company. Since August Horch was prohibited from using Horch as a name in his new car business, he called a meeting with close business friends and Franz Fikentscher from Zwickau. The 24 Hours of Le Mans is the worlds oldest active sports car race in endurance racing, held annually since 1923 near the town of Le Mans, France. It is one of the most prestigious races in the world and is often called the Grand Prix of Endurance. The event represents one leg of the Triple Crown of Motorsport, other events being the Indianapolis 500, since 2012, the 24 Hours of Le Mans has been a part of the FIA World Endurance Championship. In 2017, it will be the round of the season. The race has over the years inspired imitating races all over the globe, popularizing the 24-hour format at places like Daytona, Nürburgring, Spa-Francorchamps, and Bathurst. The American Le Mans Series and Europes Le Mans Series of multi-event sports car championships were spun off from 24 Hours of Le Mans regulations. At a time when Grand Prix motor racing was the dominant form of motorsport throughout Europe, Le Mans was designed to present a different test. Instead of focusing on the ability of a car company to build the fastest machines and this encouraged innovation in producing reliable and fuel-efficient vehicles, because endurance racing requires cars that last and spend as little time in the pits as possible. At the same time, the layout of the track necessitated cars with better aerodynamics, while this was shared with Grand Prix racing, few tracks in Europe had straights of a length comparable to the Mulsanne. Additionally, because the road is public and thus not as meticulously maintained as permanent racing circuits, racing puts more strain on the parts, increasing the importance of reliability. The oil crisis in the early 1970s led organizers to adopt a fuel economy formula known as Group C that limited the amount of each car was allowed. Although it was abandoned, fuel economy remains important as new fuel sources reduced time spent during pit stops. Such technological innovations have had an effect and can be incorporated into consumer cars. This has led to faster and more exotic supercars as manufacturers seek to develop road cars in order to develop them into even faster GT cars. Additionally, in recent years hybrid systems have been championed in the LMP category as rules have changed to their benefit. Formula Three, called Formula 3 or F3, is a class of open-wheel formula racing. 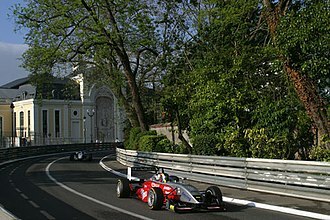 The various championships held in Europe, South America, F3 is not cheap, but is regarded as a key investment in a young drivers future career. Success in F3 can lead directly to a GP2 seat or even a Formula One test or race seat, Formula Three evolved from postwar auto racing, with lightweight tube-frame chassis powered by 500 cc motorcycle engines. 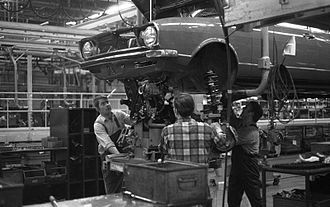 Cooper came to dominate the formula with mass-produced cars, and the income this generated enabled the company to develop into the senior categories, other notable marques included Kieft, JBS and Emeryson in England, and Effyh and Scampolo in Europe. John Cooper, along with most other 500 builders, decided to place the engine in the middle of the car, the 500cc formula was the usual route into motor racing through the early and mid-1950s. Other notable 500 cc Formula 3 drivers include Stuart Lewis-Evans, Ivor Bueb, Jim Russell, Peter Collins, Don Parker, Ken Tyrrell, from a statistical point of view, Don Parker was the most successful F3 driver. Although coming to motor racing late in life, he won a total of 126 F3 races altogether, and was described by Motor Sport magazine as the most successful Formula 3 driver in history. Although Stirling Moss was already a star by 1953, Parker beat him more than any driver, and was Formula 3 Champion in 1952, again in 1953. 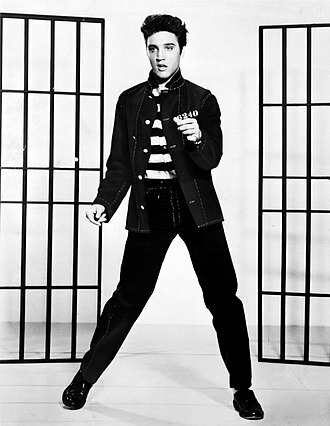 He took the title for a time in 1959. In 1954, Parker took on a man named Norman Graham Hill as his mechanic and general assistant. Some years later, now using his name of Graham. 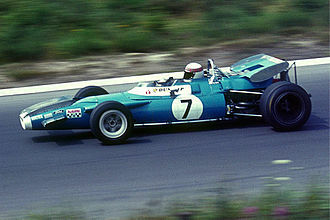 Parker retired from Formula Three after the 1959 season, and chose not to move to Formula 2 or Formula 1 because of his age. However, he did race for one season, representing Jaguar in the British Saloon Car Championships. As a retirement gift in 1961, Jaguars Lofty England presented him with a specially-designed 3.8 litre Jaguar Mark 2 and it was claimed to be the fastest Mark 2 Jaguar had built, being tested at 140 mph on the newly opened M4 motorway in 1963. 500cc Formula Three declined at an international level during the late 1950s, although it continued at a level into the early 60s. Not to be confused with Larousse Larrousse Formula One was a motorsports racing team founded in 1987 by Didier Calmels and former racer Gérard Larrousse, originally under the name Larrousse & Calmels. It was based in Antony, in the suburbs of Paris. It was renamed Larrousse after the departure of Calmels for legal reasons, the team competed in Formula One from 1987 to 1994 before succumbing to financial problems, scoring a best finish of third at the 1990 Japanese Grand Prix during this time. Larrousse & Calmels commissioned a car from Lola and the result was the LC87, the chassis was powered by a Cosworth DFZ V8 engine, and was entered in the undersubscribed normally aspirated class. The team started out in 1987 with just one car for Philippe Alliot, by that time they had agreed to a three-year deal with Lola and Chris Murphy was recruited from Zakspeed to help Bellamy. The team did a deal to run Lamborghini V12 engines in 1989, in September 1988 the team hired former Renault and Lotus designer/engineer Gérard Ducarouge but in the spring of 1989, Calmels had to quit the team because of legal issues. As a result, the became known simply as Larrousse. At the end of the year, Larrousse sold 50% of his shares to the Japanese Espo Corporation, at the same time the team moved from Antony to new premises at Signes in the south of France near the Paul Ricard Circuit. The 1990 season was Larrousses best in Formula One, things began to unravel when Lamborghini announced it was switching to Ligier. Of greater concern was the FIA considering taking away Larrousses points because of a false declaration about the design of the chassis. It transpired the team had made an honest mistake by registering the car as manufactured by themselves, although the team officially lost their points from 1990, the team kept the travel benefits and prize money associated with their championship finish and did not have to take part in pre-qualifying. Larrousse signed a deal with Brian Hart for 1991 but early in the year Espo withdrew. Although difficult to set up, the car proved relatively quick and was usually a midfield runner before succumbing to the inevitable breakdown or driver error. The 1985 German Grand Prix was a Formula One motor race held at Nürburgring on August 4,1985. It was the round of the 1985 FIA Formula One World Championship. This was the first German Grand Prix that was held on the new GP-Strecke section of the track replaced the old Südschleife section that had not been used since 1970. The GP-Strecke would not host another Grand Prix until it hosted the 1995 European Grand Prix, Michele Alboreto won the race, his fifth and last F1 victory. This event was the first occasion on which a camera was used in a race. That car was not eligible for points, and this race marked the last time, as of the 2016 season. It would be Manfred Winkelhocks last ever Formula One Grand Prix, the German was killed after he crashed his Porsche 962C sportscar at the 1000 km of Mosport in Canada just a week after the German Grand Prix. A surprise pole position went to Teo Fabi, the first of his career, and this was a time he set during Fridays qualifying session, during Saturday it rained and none of the drivers could improve on their times. The 199624 Hours of Le Mans was the 64th Grand Prix of Endurance, and took place on 15 and 16 June 1996. It was won by a Tom Walkinshaw-Porsche prototype run by Joest Racing with drivers Davy Jones, Manuel Reuter and Le Mans rookie Alexander Wurz completing 354 laps. While not being the fastest car on track, it hit the front in the first hour and this was Reuters second Le Mans victory, and the first for Jones and Wurz, who, at 22 years old, became the youngest ever Le Mans overall winner. LMP1 and P2 got closer to the IMSA-WSC category with new and this year the ACO halved the number of automatic entries from 20 to 10. They received an initial 107 applications and accepted 66 for pre-Qualifying in April on top of the automatic-10, still with no co-ordinated European sports car series there were only 14 prototypes, albeit of a high quality. Kremer and Courage returned, this time challenged by a new Porsche prototype developed by Joest Racing in conjunction with TWR Motorsport. The TWR-Porsche WSC-95 was born from the shell of a TWR-designed Jaguar XJR-14 racing car, modified to a top design by Tom Walkinshaw Racing. Three IMSA-WSC cars turned up, two Ferrari 333 SPs run by Scandia Racing versus the much-improved Riley & Scott. In another small LM P2 field of four cars and Bonnet were joined by a Kudzu-Mazda stepping across from WSC, as expected, the bulk of the field was in GT,27 cars in GT1 plus 12 in GT2. Many teams came from the thriving BPR Global series, defending champions McLaren-BMW had updated 1996-spec cars, with tighter air restrictors dropping the power output slightly. This time they included a run as a BMW works team. The McLarens were joined again by Nissan and Lister, chrysler-Dodge returned with a quartet of Vipers with their big rumbling 8-litre engines, one pair run by ORECA in the BPR and the second pair by Canaska-Southwind in the North American series. But, perhaps as might be expected, the big news was with Porsche and this was, quite literally, virtually a Porsche 911 in name only, with the visual similarity of a squashed, lengthened 911. 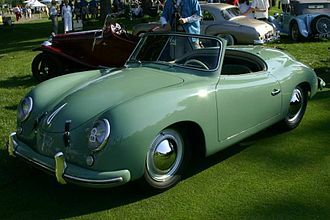 This was Porsches first ever mid-engined car, using a purpose-designed 3. Porsche has been successful in many branches of motorsport of which most have been in long distance races. The Porsche 917 of 1969 turned them into a house, winning in 1970 the first of over a dozen 24 Hours of Le Mans. With the 911 Carrera RS and the Porsche 935 Turbo, Porsche dominated the 1970s, and even has beaten sports prototypes, Porsche is currently the worlds largest race car manufacturer. In 2006, Porsche built 195 race cars for international motor sports events. Some aspect of the car almost invariably, was being developed, notable early successes in the USA included an overall win in the 1964 Road America 500 for an under-2-litre RS-60 driven by Bill Wuesthoff and Augie Pabst. The 90x series of cars in the 60s saw Porsche start to expand from class winners that stood a chance of overall wins in tougher races where endurance and handling mattered, to likely overall victors. Porsche first expanded its 8-cyl flat engine to 2.2 litres in the 907, developed the 908 with full three litres in 1968. Based on this 8-cyl flat engine and a loophole in the rules, the 4. 5-litre flat 12917 was introduced in 1969, eventually expanded to five litres, and even to 5.4 and turbocharged. Within few years, Porsche with the 917 had grown from underdog to the supplier of the fastest and most powerful car in the world. Even though introduced in 1963, and winning the Rally Monte Carlo, the water-cooled Porsche 996 series became a success in racing after the GT3 variant was introduced in 1999. The Porsche 917 is considered one of the most iconic racing cars of all time and gave Porsche their first 24 Hours of Le Mans win, Porsche scored a couple of unexpected Le Mans wins in 1996 and 1997. A return to racing in the USA was planned for 1995 with a Tom Walkinshaw Racing chassis formerly used as the Jaguar XJR-14. This is a feat Porsche had achieved in the 956 era, between 1998 and 2014, Porsche did not attempt to score overall wins at Le Mans and similar sports car races, focusing on smaller classes and developing the water-cooled 996 GT3. Jackie Stewart and Tyrrell won their first championship with the French Matra chassis. Tyrrell's first F1 car, the 001, being demonstrated at the 2008 Goodwood Festival of Speed. Mika Salo driving for Tyrrell at the 1995 British Grand Prix. An Aston Martin DBR9 entered by BMS Scuderia Italia. The team's cars traditionally feature a large stripe painted across the nose or bonnet. Joest Racing's Porsche 962 which they used in the IMSA GT Championship. The Joest Racing team at work on their cars before dawn for the 2012 12 Hours of Sebring. Joest's successful Audi R8, winner three years in a row. 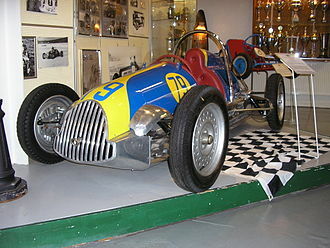 A typical early car, the Effyh 500 (1947–1952) was built in Malmö, Sweden and was one of the more successful cars. It had a lightweight tube chassis, aluminium bodywork and was powered by a 500cc 1-cylinder JAP engine. Targa Florio winning 1973 Porsche 911 Carrera RSR in Martini Racing colours at the 2006 Goodwood Festival of Speed. Porsche 956 and 962C, like this in Jägermeister livery, won the 24 Hours of Le Mans six years in a row in the 1980s. The 3 2015 Porsche 919 Hybrid LMP1 cars from Porsche LMP Team entering Raidillon at the 2015 WEC 6 Heures de Spa-Francorchamps. The 917 gave Porsche its first 24 Hours of Le Mans win in 1970. An Audi R8 in its final race. This R8, in a special crocodile livery, won the Race of a Thousand Years in Adelaide, Australia, in 2000 driven by Allan McNish and Rinaldo Capello. Ruins of the Emperor's palace in Mediolanum. 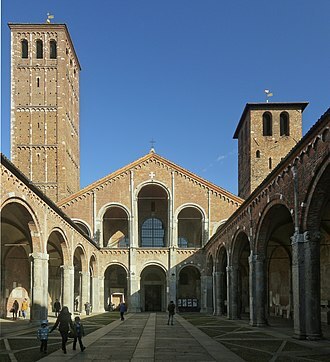 The Basilica di Sant'Ambrogio, it is not only a monument of the early Christian and medieval epoch, but also the second church for the importance of the city of Milan. 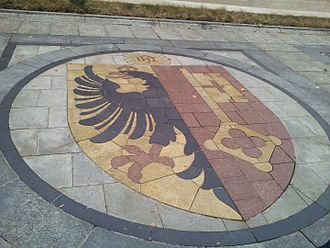 The biscione eating a child on the Visconti coat of arms. The team's FA15 chassis at the 2008 Silverstone Classic event. 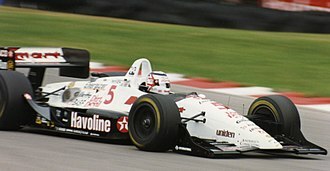 Massimiliano Papis driving for Footwork at the 1995 British Grand Prix. Grandstands on the front stretch. Panorama shot of the speedway from the grandstands. Michele Alboreto won the race for Ferrari. Closeup of the winning Schuppan/Holbert/Haywood Rothmans Porsche 956.